Night hasn’t changed members since 2012. 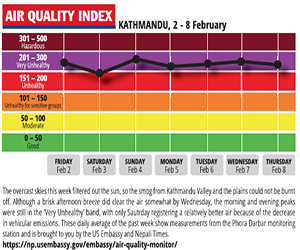 “We feel we’ve reach a confident phase during these last two years,” comments Niraj Shakya. During this period, the band recorded songs in studio and a few of them have been released via digital downloads. They also began the project ‘Know your instrument’ to present the endangered instruments of Nepal via short documentaries. This year, Night finally comes with a hard copy of ‘Ani Ukali Sangai Orali’ after signing to Subsonic Routes, a London-based record label run by the Nepali, Shubha Giri. 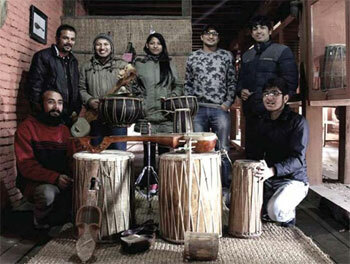 This tribute to the mosaic of Nepali music is defined as ‘new-school folk music’ by the band members. 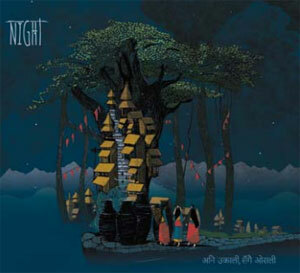 Indeed, Night gives a refreshing vibe to the Nepali music scene. The debut album shows that Night actually know their instruments. Up to 24 are played on ‘Ani Ukali Sangai Orali’ and most of them being recorded in modern settings for the first time. But Night isn’t just instruments. Singer Sumnima Singh amazes as she easily shifts from low tones to high-octaves. Her voice fits well with Jason Kunwar’s timbre to weave in the masterfully arranged compositions. The whole makes ‘Ani Ukali Sangai Orali’ an album that is close to perfection. The emotion that lies in ‘Tuina Ko Cha Hai Bhara’ is a good example. One could only regret the fretless bass isn’t more present in Night’s new-school folk. Through the lyrics, Night also pays tribute to the harsh life of villagers they have met while moving around the country. The title track (meaning ‘With the climb, the descent’) alludes to the daily experience of Nepalis climbing up and down the rural hills. The short and powerful ‘Sunko Jutta’ (Gilded shoes) is a reference to the steady rise of Nepalis going to the Gulf in search of a better future, but who return home in boxes. Like the getaways in remote regions of the country have helped its composition, ‘Ani Ukali Sangai Orali’ is an exploration, a journey traditional Nepali music unveils with fresh hitherto unheard sounds.